Prepare 2 dishes at one go with Song-Cho Conventional Rice Cooker (SCC103)! Add brown rice and water into SCC103 rice cooker. Press the button and the COOK indicator will be lighted. While the rice is cooking, prepare the stuffed tofu. Marinate the minced pork with the rest of the ingredients and set aside for at least 30 minutes. Remove some tofu from the center for stuffing and apply some potato starch onto the surface. 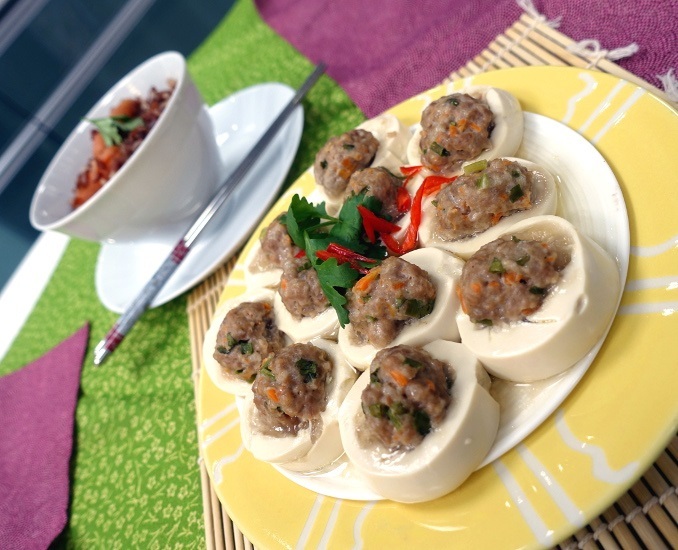 Scoop approximately 2 teaspoon of minced pork and roll into a ball, placed on top of the tofu. Place a plate onto the steamer and put the stuffed tofu onto the plate. When lots of steam starts to escape from the rice cooker, open the lid and place the steamer into the rice cooker. Close the lid and let it continue to cook till program completes. When the WARM indicator lights up, remove the steamer and close the lid (let the rice rest for another 15 minutes). Remove the plate from the steamer and serve with rice.